How long have you worked at Loxleys and what did you do before? : For about a year-and-a-half. Before that I worked in other restaurants in Stratford. 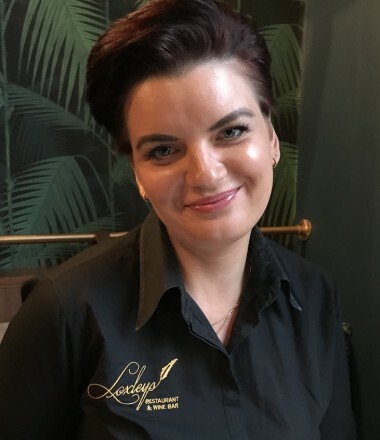 Why Loxleys: My friend Suzanne, who is assistant manager, came to work here and told me how great it was. What's your biggest career influence: My sons. Working in hospitality works well with them, because of the hours. It's also great fun. What's your favourite part of the job? : Meeting the people, customer service, making sure everyone has a good time. Describe your perfect day: A lie-in in bed, a nice breakfast, maybe a trip to a spa. That would be a perfect day and then maybe a glass of wine to finish off. In 5 Years I Want To Be: 10kg lighter. Favourite Food: Meat, meat and more meat. Favourite Holiday Destination: It depends if it's with my children or not. If they come, Poland so we can have family time. If not, Majorca with my husband. You may be Interested to know : I had my son when I was in the last year at school. When I was passing my exams, he was outside waiting with my husband.